The leaves changing colors–I’m partial to those gorgeous red ones! These blondies… there’s no words, really. 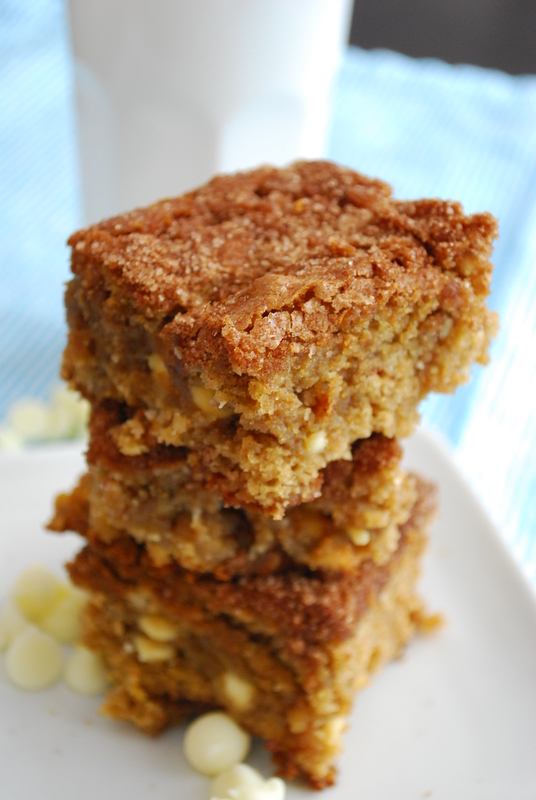 White Chocolate Snickerdoodle Blondies. Even the name sounds sweet, and sweet these are. They’re chock-full of brown sugary goodness, swirled with cinnamon + sugar and bursting with white chocolate chips. The cinnamon sugar sprinkled on top creates a beautiful crunchy crust that lends a sweet and spicy flavor to these awesomely outrageous blondies. 2. In a deep medium saucepan, melt the butter and brown sugar together over medium heat, stirring occasionally. Remove from heat and allow to cool for about 5-10 mins. 3. Stir in the vanilla and the eggs, one at a time. Stir in the flour, cinnamon, baking soda, baking powder and salt until a soft dough forms. At the last second, stir in the white chocolate chips, gently combining. 4. Pour the mixture into the prepared pan. 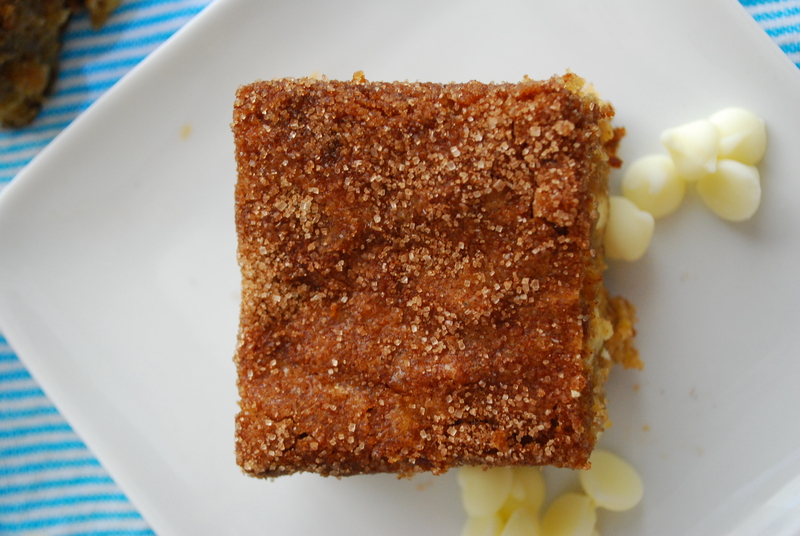 Top with the cinnamon sugar (you want to cake it on for that crust). Bake for 25-30 minutes or until lightly golden and center is just set. Cool in the pan completely before cutting into bars. These bars are AMAZING! Definitely one of my favorite blondie recipes of all time… and if you know me, that’s saying a lot. If you’ve never thought to add white chocolate to your classic snickerdoodle cookie, please amend your thinking because it’s a wonderful, irresistible addition that needs to happen! I’m off to try on my boots and pretend it’s fall. Apple cider anyone?? These looks fantastic! I love white chocolate, snickerdoodles, AND blondies – so I should love this. I pinned it so I wouldn’t lose track of the recipe. (I also love the Walking Dead). So have you used white chocolate peanut butter? I was at the store buying all the “hip” stuff I’ve never tried – Nutella, Biscoff, Jif chocolate, and then this Peanut Butter Co. white chocolate peanut better as well as dark chocolate peanut butter. Mr. Picky-eater and I are going to have a taste-test – but you’ve used everything and wanted to know if you have featured this white chocolate in any recipes? I’ve seen that one but I haven’t featured or used it before! It looks awesome–the Bees Knees one looks super yummy! However, I HAVE sampled and used PB Crave’s line of PB–the razzle dazzle one is my fave, but they have a cookie one and a dark & white chocolate one too. So yummy! LOVE the flavors in this blondie!!! Yes they whats good about fall! Around here, fall lasts about two days and then its just gray and cold! I’ll have to make these throughout the winter too! They’ll make me happy! they look so good—I recently just posted another white choc blondie recipe and now have a few on my site and so I have to stop posting them I think 🙂 but that doesn’t mean I’ll ever stop making white choc blondies! YUM! The top of these bars remind me of Cinnamon Toast Crunch which has always been one of my favorite cereals! I would love the cinnamon with the white chocolate! I am with you on most of those things,but I am one of the few clingng to summer! I do love cinnamon and apple everything though, so there is an up side. I am pinning these, gotta try them! These look amazing…I love anything with white chocolate!! And there are the blondies, ooo yum. They are like the blank canvas of the brownie world. YUMM, can’t wait to try these out. We’re total fans of white chocolate at my house…AND, my non-sweets eating husband actually LOVES snickerdoodles, so this is definitely a recipe that would go over well here! Hee, it must be the season for snickerdoodles…I’m baking a version this week, too. Whether or not I get them posted this week is another story! =) Love, love, LOVE these! Ha – I just posted white chocolate blondies, too! But I am bookmarking these babies for the next time I get a blondie craving! I’m sorry–next time blondie craving?? You mean you don’t crave them 24/7 like I do?! You and I have a lot in common with our love of Fall. Seriously my favorite season. Probably because of the weather? :)LOVE these blondies, going in my to-do box! Hayley! I love your list of fall favorites! I personally cannot even WAIT for the fall to come!! pumpkins, candy corn, halloween (fave holiday!! ), apple pie, etc. LOVE IT ALL girl! 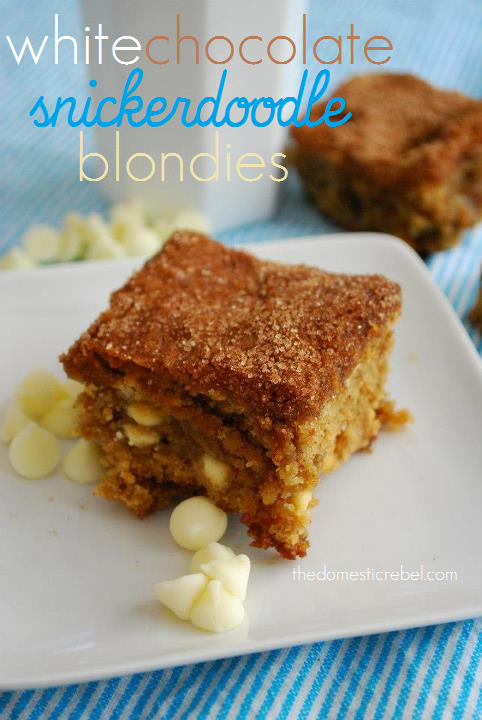 And these blondies – i’m blown away! they look so dense and chewy! mine were a tad more cakey and cookie-like. But i love your version! I’ve never used vanilla bean paste before! I love snickerdoodle anything, I can’t wait to try these! Thank you so much for contributing this to the link party at mommy’s sweet confessions! See you at the next one! The 1 cup of cinnamon sugar was way too much; I ended up using about half a cup, and still had to pour a layer off after they cooked. It was so much it didn’t turn into a hard crust, just sat on the top. Otherwise they were delicious!